OXFORD, Ohio — Miami University alumni, faculty, and students are behind the scenes and on the stage as part of Indiana’s 2016 Richmond Shakespeare Festival. Now in its third season, this summer’s productions include The Comedy of Errors and The Tragedy of King Lear and coincide with a year-long international celebration of the 400th anniversary of the legacy of William Shakespeare. The festival is presented annually and is a community-wide collaboration and celebration, welcoming participants and guests, regionally and nationally. 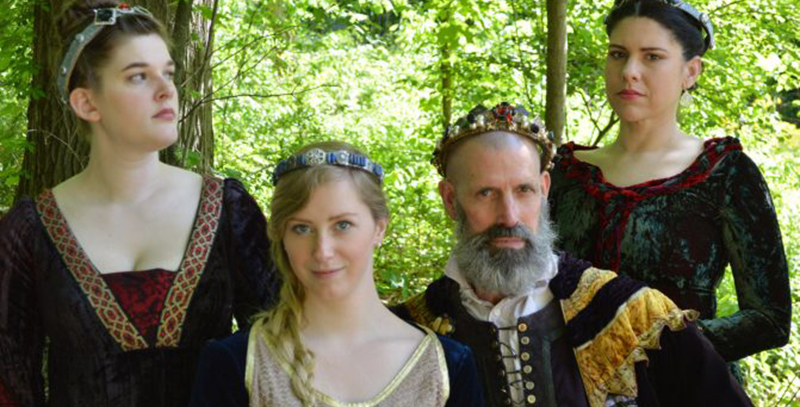 The mission of the Richmond Shakespeare Festival organization is to produce and promote an annual Shakespeare festival of the highest quality, including theatrical performances and educational opportunities, based in Richmond, Indiana. Performances this year feature production, design and casting by Miami’s blend of professionals and volunteers, to include lead roles in the productions being played by Jeremie Korta, visiting professor of French and Italian and Scott Shriver (’78) a RedHawk announcer. The Richmond Shakespeare Festival was created by a group of volunteers following the 2013 production of The Tempest at Richmond Civic Theatre as a fundraiser to benefit Studio 10, RCT’s studio theatre program. For Shriver, it’s more personal. Both evening and matinee performances run through Sunday, June 26 at the historic and newly renovated Starr-Gennett piano factory building in the Whitewater Gorge Park in Richmond, Indiana. Other Miamians contributing to this year’s productions include; Julia Guichard, chair of theatre (text coach); Cate Hudson, senior theatre major (actress and costume coordinator); Adam Joesten, senior theatre major (actor); Melanie Mortimore, assistant professor of theatre (costume designer); Colin Sapienza, senior theatre major (actor); and Brenton J. Sullivan, senior theatre major (actor).